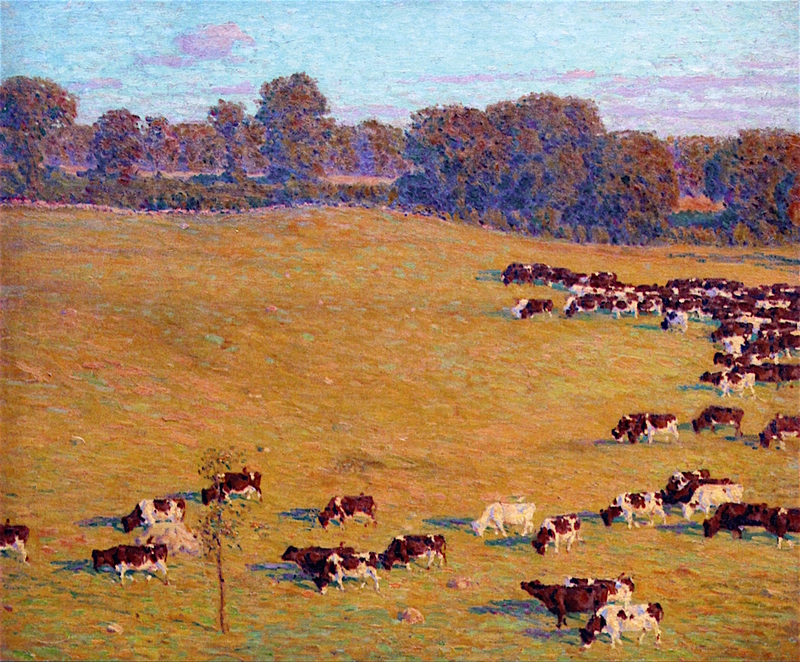 Edward Charles Volkert (1871-1935), Cows in a Sunlit Pasture (date not known), oil on canvas, 40.6 x 50.8 cm, Private collection. Farm animals, particularly cattle, have long been accepted as a strong sub-genre of landscape painting, with its exponents such as Constant Troyon widely celebrated. Oddly, the American Impressionist Edward Charles Volkert (1871-1935), who made a career of painting cattle and rural scenes, appears to have been almost forgotten. Edward Volkert was the son of an immigrant from Alsace (which had alternated between French and German rule), and was born in Cincinnati, Ohio. He studied at the Cincinnati Art Academy under Frank Duveneck (who also taught John Henry Twachtman), then at the Art Students League in New York, under William Merritt Chase. Although he was a popular portraitist in New York City, he increasingly preferred to paint scenes in rural Ohio, where he developed his particular taste for painting cattle. He was first invited to visit Old Lyme, Connecticut, as a guest of Florence Griswold, who cultivated friendships with Childe Hassam and several American Impressionists. He eventually moved to Hamburg (near Old Lyme) in 1922, so that he could concentrate on oxen, which he said were better than cows at posing, as they were less inquisitive. I have only been able to track down a few of his paintings, most of which appear to come from late in his career, when he was painting in Connecticut. Earlier on he apparently had a Divisionist style. He kept a record with miniature copies of most of his paintings in what he termed his ‘Cattle Logs’. Their whereabouts is unknown, although they would seem likely candidates to be broken up and sold piecemeal, which would be a great tragedy. Edward Charles Volkert (1871-1935), Autumn Afternoon (date not known), oil on canvas, 73.4 x 83.8 cm, Private collection. The Athenaeum. Edward Charles Volkert (1871-1935), Autumn Pasture (date not known), oil on canvas, 40.6 x 50.8 cm, Private collection. The Athenaeum. Edward Charles Volkert (1871-1935), Cattle Grazing at Midday (date not known), oil on canvas, 50.8 x 61 cm, Private collection. The Athenaeum. Edward Charles Volkert (1871-1935), Grazing Cattle (date not known), oil on board, 22.2 x 29.2 cm, Private collection. Movie clips of Volkert painting, from the Florence Griswold Museum. Posted in General, Painting and tagged cattle, Chase, Duveneck, Griswold, Impressionism, painting, Volkert. Bookmark the permalink. Funnily enough, I have had him in my ‘in’ tray for some months now. I must get round to writing about him soon. His paintings are wonderful, and ground-breaking in their way, and his life fascinating if tragic. What wonderful pictures from an Alsatian son. There are two Cattle Logs that are still intact and one I’ve seen personally as I’m a close friend of the Volkert family and more especially ECV III. Thank you for letting me know: that is wonderful to hear. Wouldn’t it be great if, say, a PhD student were to start work on a thesis on his life and work?